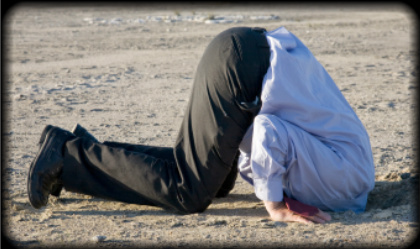 An evangelical with his/her head buried in the sand. A self-professing evangelical who circumvents or avoids acknowledgement of biblical doctrine (creed) and/or the godly practices that originates from such biblical doctrine (deed). A self-professing Christian believer who evidences the obfuscation of the factual truth at all costs, particularly as it pertains to Gospel Truth.